Doubting in 3D? Twenty seven building blocks of professional awareness! 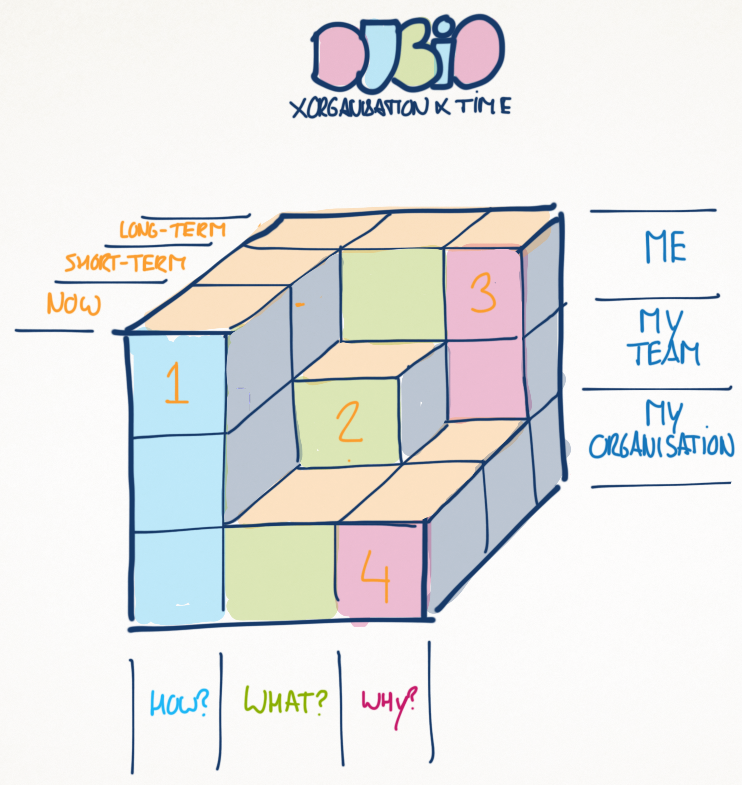 In an experiment to 1) see how I can visualise three variables in a cube-style image, and 2) to see what happens if I multiply the what-, how- and why questions with two perspectives at the same time (in this case an organisational- and time-perspective), I drew the image below. Besides it being a visualisation excercise, I wanted to see if the ‘crossing’ of three interesting variables would lead to a new, even more interesting insight. I believe crossing or multiplying variables is interesting to do, but I also believe it’s only a sense-making method, that requires some context and follow up to have any actual value. The top left cube represents my current how. That could be the skills, methods and tools I currently have access to. Cube number two would be called our short-term what, meaning short term plans, choices that we’ve made for the short-term, or options that we could potentially choose in the near future. The third is my long-term purpose, like my values or motives (that are not likely to change), and my long-term ‘needs and wants’. And the cube at the bottom right corner symbolises the the current purpose of the organisation I work in. I think corporate values and business principles could fit to this cube. Maybe… just maybe… the process of describing all twenty seven cubes for my particular context could help me become more aware of my professional identity. It could be a good starting point to not only understand my ‘playing field’, but also provide pointers to change something. After all, most agree that the key to better performance or more work satisfaction is often found in the environment (team or organisaitonal), rather than the individual. Q: Does this resonate with you? Should I add the past to the cube’s time-axis? « How does my personal identity compare to my organisation’s identity?